HMMH provided On-Board Sound Intensity (OBSI) tire/pavement noise measurement services along I-195 between I-95 and East Providence, RI for conditions both prior to and after diamond grinding of the existing mainline concrete bridge deck and on/off/interchange ramp surfaces. The goal of the grinding was to reduce noise generated by traffic traveling over transverse-tined concrete. 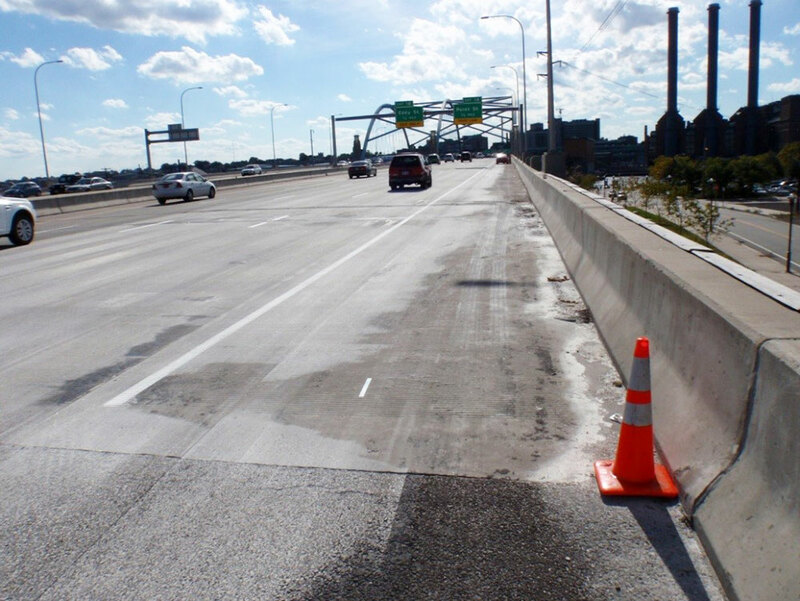 This innovative project required measurement, analysis, and presentation of continuous OBSI time histories for the entire study area consisting of eight travel lanes and many ramps for a total of approximately nine miles tested. The contractor’s payment bonuses/penalties were tied to measured OBSI levels after grinding, which challenged the testing program with the need for near-immediate measurements of the diamond-ground pavements. Overall, OBSI levels were reduced by 4 to 8 decibels due to the grinding and the contractor was successful in meeting the project noise reduction goal throughout the study area.